In case you were wondering, I am not eating any grains anymore. Which makes life interesting. It’s tough to eat at a coffee shop and it’s really hard to order in! Especially pizza. I get the “but we have a gluten free option!” all the time. I’m sure that’s helpful for many people, but it doesn’t solve my problem of grains. 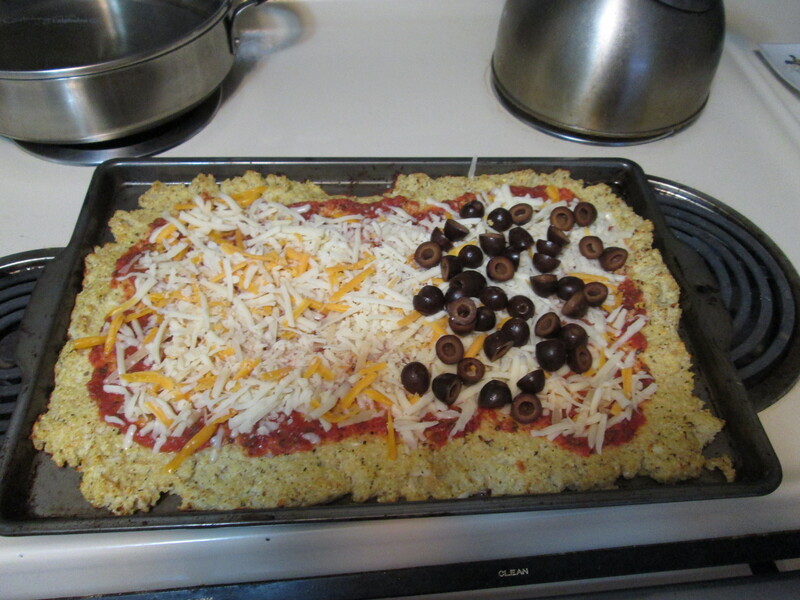 In my searches I found this great recipe for cauliflower crust pizza! You’ll notice that we’ve altered it a LITTLE bit. 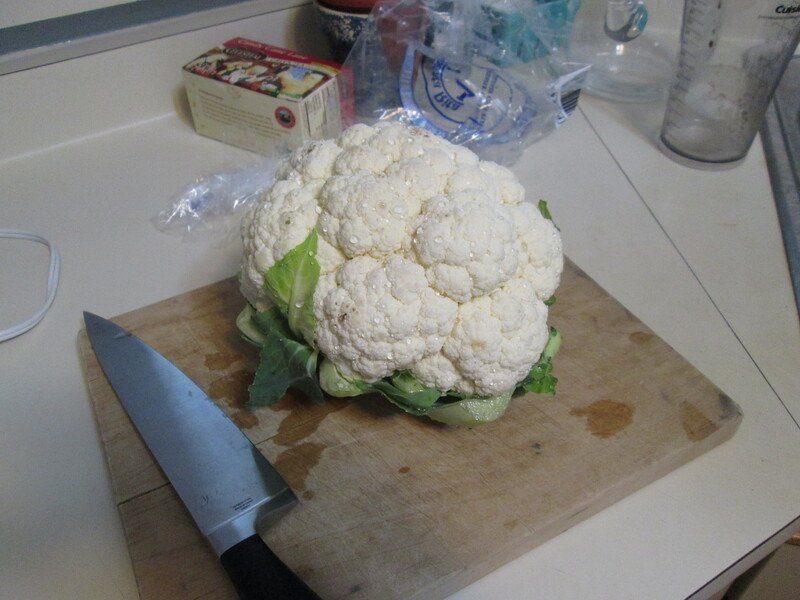 I’ve always been skeptical of these miraculous cauliflower solutions. My husband doesn’t care for cauliflower and there’s just nothing like the real deal, right? Well, that’s still true. This is not like a normal pizza. Please do not make it thinking it will be the same as your wonderful, fluffy, crunch, awesome pizza you are used to. It is awesome, but it’s not made with dough, so it’s really different. I will say, it’s excellently delicious! It’s even a hit with the guy who doesn’t care for cauliflower! 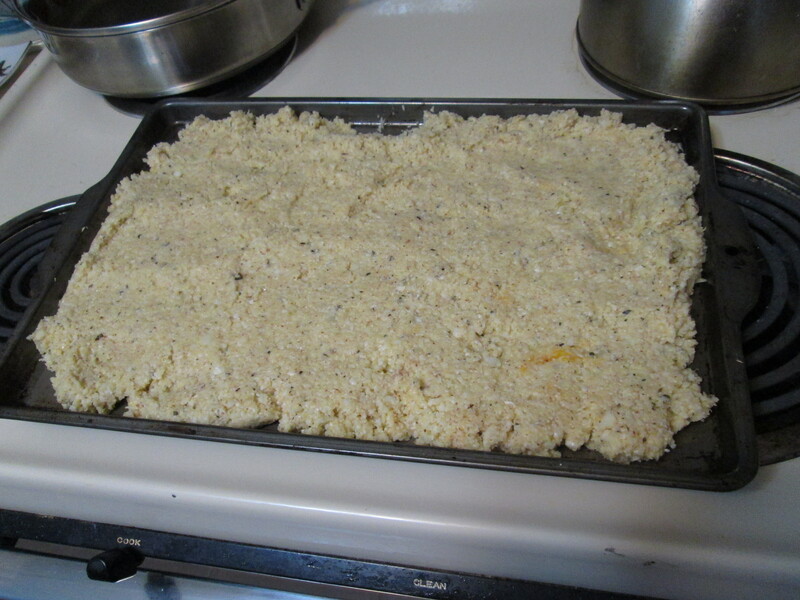 Preheat the oven to 450 F. AND PUT IN YOUR BAKING SHEET NOW! If you don’t, your crust will absolutely stick. 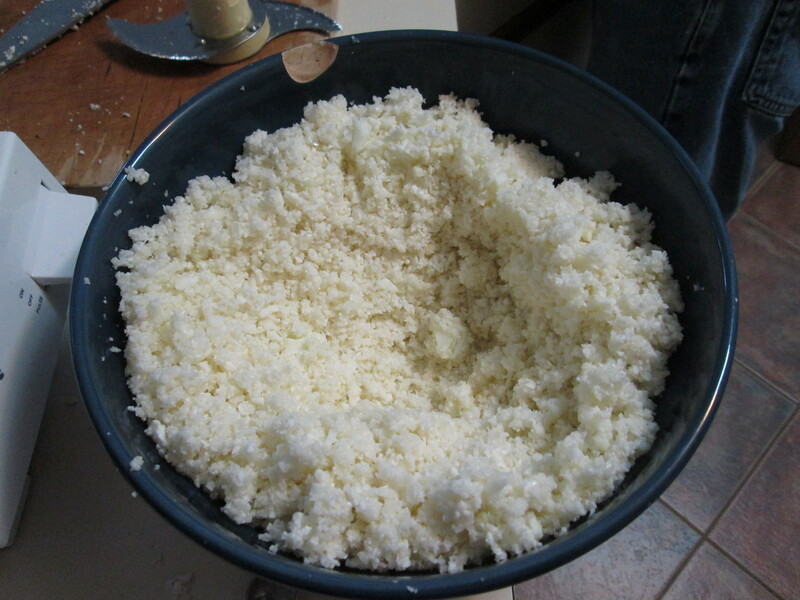 Add it in small portions to your food processor to make “cauliflower rice.” If I put in too much at once, I end up with pulverized cauliflower that still has large chunks in it. It’s better to do this step a little at a time. 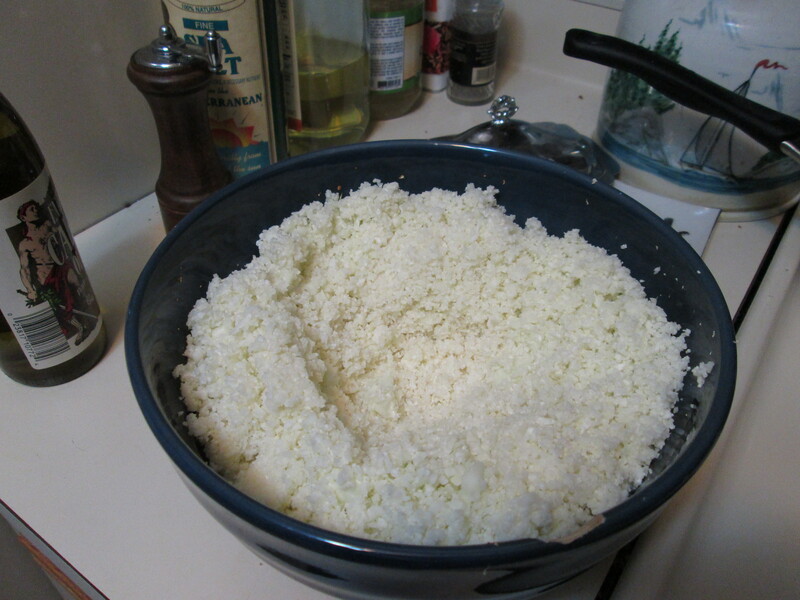 The amount shown is about how much I add at one time in order to make it come out ok.
Microwave the bowl of riced cauliflower on high for 6 minutes. My husband likes to dig a little hole in the middle before we do this step. While it’s microwaving, you can get out your other spices, etc. to add to the crust. 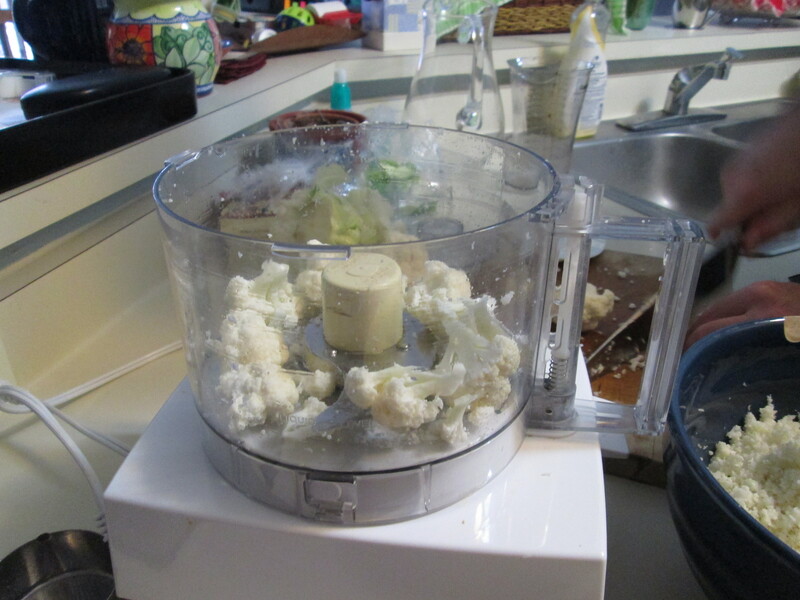 Set the cauliflower to cool off for 5-10 minutes once it comes out of the microwave. 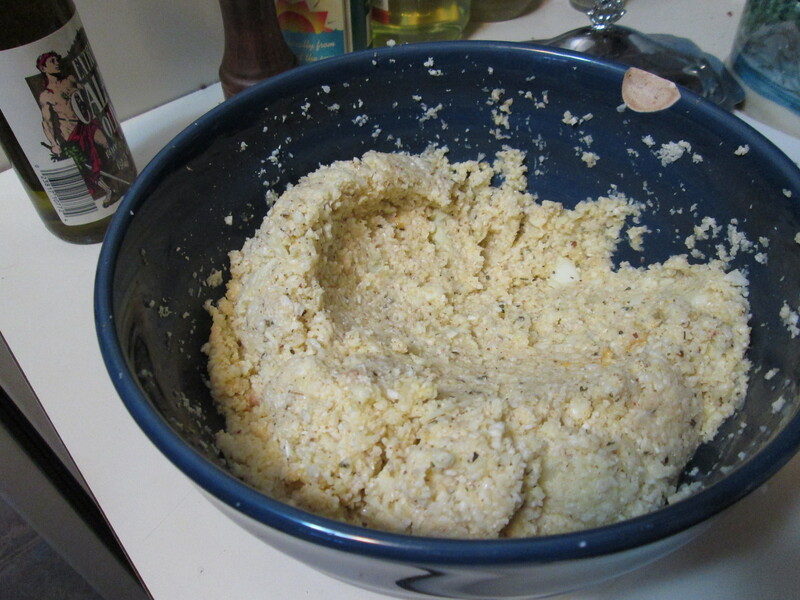 Mix the spices, almond flour, eggs, and cheese into the cauliflower. 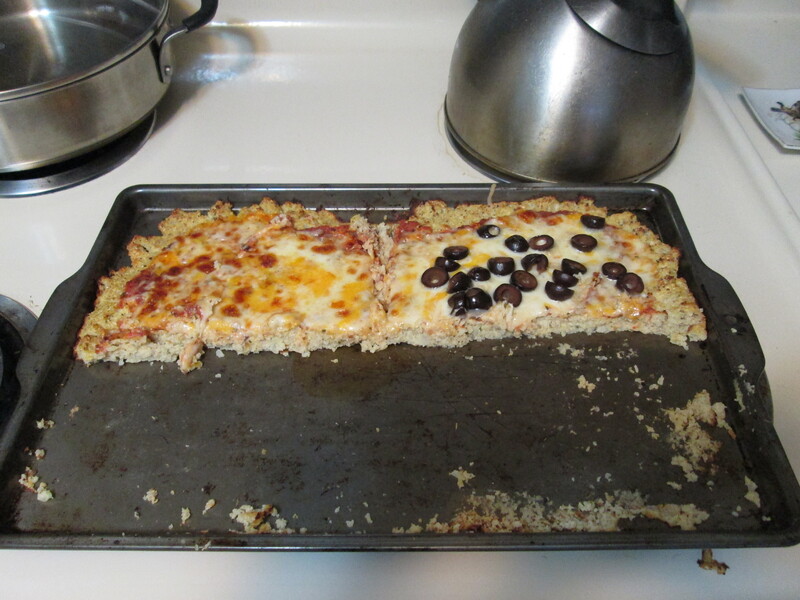 Remove your baking sheet from the oven and add some oil to keep the pizza from sticking too much. We’ve had many a pizza stick to the pan like crazy! This is the biggest pizza we’ve EVER made! Add your crust to the pan. It should sizzle a bit when you put it on the heated pan. Return the pan to the oven for 10-15 minutes. We like our crust to be turning golden before we add our toppings. 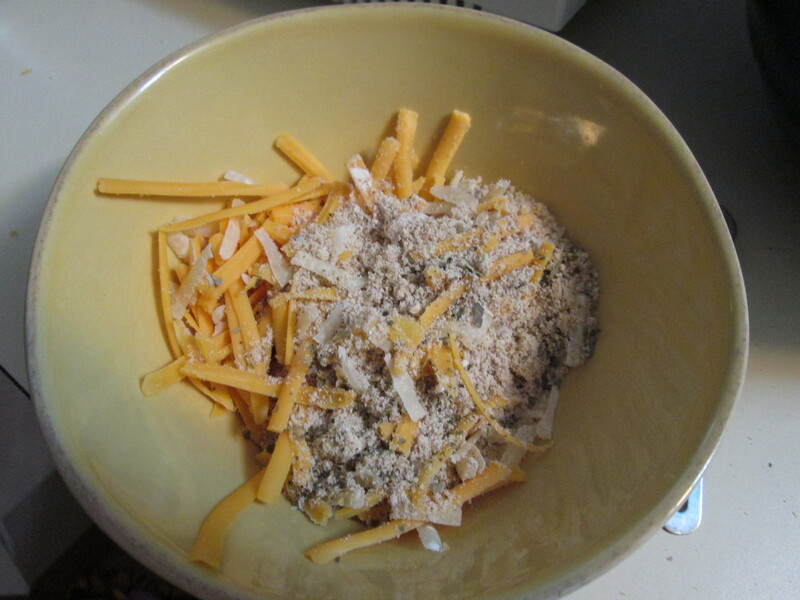 Add toppings and return to the oven for another 10 minutes or so. We got a little excited and dug in fast! Enjoy eating this delicious food!